There’s some interesting matchups in Week 7, and I think you can put a really good lineup together this week. The way you do that is by finding value in guys that are underpriced and pairing them with the 15+ weekly scoring studs. Picking the right studs is usually make or break, as you need them to anchor your team. So, let’s look at some of these high priced guys that you should feel comfortable with in your lineup this week on FanDuel , and a few others you should stay away from. As usual, we’re only looking at higher priced players, typically $8,000 or more. 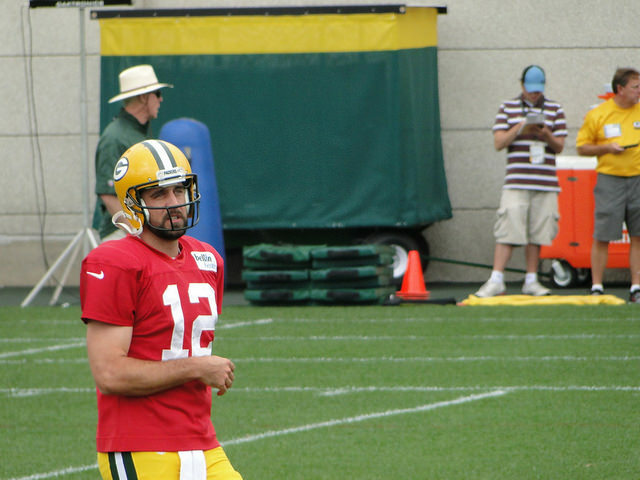 Aaron Rodgers: $9,700 – I like Rodgers more than Manning and Luck this week, who are both priced higher. He’s on fire with 10 touchdowns in his last three games, and I think he’ll throw at least another three this week. Feel comfortable with Rodgers at the top of your lineup. Arian Foster: $9,100 & Le’Veon Bell: $8,400 – These guys both run so fluidly and are having great seasons. The Texans are going to use Foster as its workhorse, and 100+ yards and 2 TDs in Week 7 is a big possibility. Bell on the other hand, is guaranteed to rack up the yards each week, but he just hasn’t found the end zone very often. I think he gets that monkey off his back in a big way this week. Jordy Nelson: $8,900 – See Aaron Rodgers above. I love the Rodgers/Nelson stack this week. Nelson gets so many targets and is such an explosive player. He has the potential to gain you 14 points from just one play! Stacking Rodgers and Nelson this week could give you 50+ points relatively easy. Antonio Brown: $8,700 – For some reason, I think the Steelers offense is going to perform well this week. Maybe I’m crazy, but this team has bounced around this year. I just feel like that at home and after a bad loss, they’ll score some points. Brown is like Nelson, getting plenty of targets and almost guaranteed to go over 100 each week. Drew Brees: $9,100 – Brees is going to have volume going for him this week. However, playing the surprising number one defense in the league isn’t a recipe to break out of his average performance streak. Sadly, average for Brees is the 18.8 points per game he’s averaging on Fanduel. I’d stay away this week, as there are some guys cheaper than him that I like a bit more. Julio Jones: $8,700 – I don’t like fading Jones, but I’m just not seeing it out of the Falcons. On the road in Baltimore isn’t what Matt Ryan and Jones need to get things rolling again. The Falcons offense is hard to figure out. There’s a chance I’m wrong here because Jones is elite and will get a lot of targets, but I just think another average day is in store for Jones in Week 7. DeSean Jackson: $8,000 – Jackson has been impressive the last two weeks. He’s a big play receiver and he needs those big plays to score, so he’s not a guy who’s going to catch seven or more passes each week. I don’t think the big play comes this against the Titans, leaving Jackson with my projection of 60 receiving yards from 3 or 4 catches, and no scores.